Please enter by Joon Hiang Road to park at the church’s basement carpark. All vehicles are to park at the basement carpark. Parking along the driveway in the carpark is not permitted. Also, no vehicle is allowed to park at the open plaza and yellow-boxed areas. 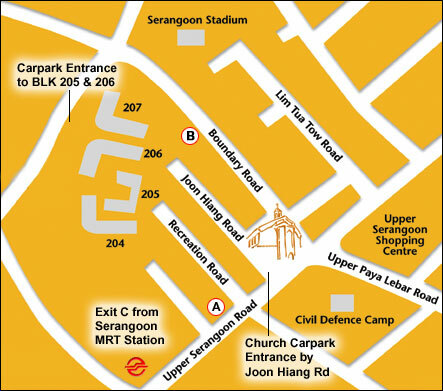 Please park around the housing estates ( Serangoon Central Block 205 or 206/Lor Lew Lian) when all carpark lots are filled. Please co-operate with the carpark officers. REMINDER: Please do not park along Joon Hiang Road. Be considerate to residents who need to go out and return home on Sunday mornings.